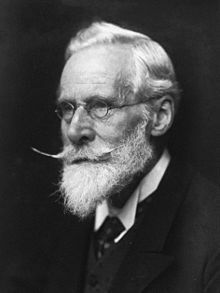 Sir William Crookes OM PRS (/krʊks/; 17 June 1832 – 4 April 1919) was a British chemist and physicist who attended the Royal College of Chemistry in London, and worked on spectroscopy. He was a pioneer of vacuum tubes, inventing the Crookes tube which was made in 1875. In 1913, Crookes invented 100% ultraviolet blocking sunglass lens. Crookes was the inventor of the Crookes radiometer, which today is made and sold as a novelty item. Late in life, he became interested in spiritualism, and became the president of the Society for Psychical Research. Crookes made a career of being a meteorologist and fierce lecturer for multiple studies and courses. Crookes worked in chemistry and physics. His experiments were notable for the originality of their design. He executed them skillfully. His interests, ranging over pure and applied science, economic and practical problems, and psychiatric research, made him a well-known personality. He received many public and academic honours. Crookes's life was one of unbroken scientific activity. William Crookes was born in London in 1832, the eldest of 16 siblings. His father, Joseph Crookes, was a wealthy tailor and real estate investor, of north-country origin, at that time living with his second wife, Mary Scott Lewis Rutherford Johnson. At age 16, Crookes entered the Royal College of Chemistry to study organic chemistry. There, he became an assistant to August Wilhelm von Hofmann, allowng him to attend the Royal Institution, and at a meeting Crookes met Michael Faraday who convinced him switch to optical physics. From 1850 to 1854 Crookes filled the position of assistant in the college, and soon embarked upon original work. It wasn't in organic chemistry which the focus of his teacher, August Wilhelm von Hofmann, might have been expected to lead him towards, but into new compounds of selenium. These were the subject of his first published papers, 1851. He worked with Manuel Johnson at the Radcliffe Observatory in Oxford in 1854, where he adapted the recent innovation of wax paper photography to machines built by Francis Ronalds to continuously record meteorological parameters. In 1855 he was appointed lecturer in chemistry at the Chester Diocesan Training College. After his father's death Crookes received a large inheritance and opened his own physics laboratory. In 1856 Crookes married Ellen, daughter of William Humphrey of Darlington. They had three sons and a daughter. Married and living in London, he was devoted mainly to independent work. In 1859, he founded the Chemical News, a science magazine which he edited for many years and conducted on much less formal lines than was usual for the journals of scientific societies. In 1861, Crookes discovered a previously unknown element with a bright green emission line in its spectrum and named the element thallium, from the Greek thallos, a green shoot. Crookes wrote a standard treatise on Select Methods in Chemical Analysis in 1871. Crookes was effective in experimentation. The method of spectral analysis, introduced by Bunsen and Kirchhoff, was received by Crookes with great enthusiasm and to great effect. His first important discovery was that of the element thallium, announced in 1861, and made with the help of spectroscopy. By this work his reputation became firmly established, and he was elected a fellow of the Royal Society in 1863. Crookes developed the Crookes tubes, investigating cathode rays. He published numerous papers on spectroscopy and conducted research on a variety of minor subjects. In his investigations of the conduction of electricity in low pressure gases, he discovered that as the pressure was lowered, the negative electrode (cathode) appeared to emit rays (the so-called "cathode rays", now known to be a stream of free electrons, and used in cathode ray display devices). As these examples indicate, he was a pioneer in the construction and use of vacuum tubes for the study of physical phenomena. He was, as a consequence, one of the first scientists to investigate what is now called a plasma and identified it as the fourth state of matter in 1879. He also devised one of the first instruments for studying nuclear radioactivity, the spinthariscope. Crookes investigated the properties of cathode rays, showing that they travel in straight lines, cause fluorescence when they fall on some substances, and that their impact can produce great heat. He believed that he had discovered a fourth state of matter, which he called "radiant matter", but his theoretical views on the nature of "radiant matter" were to be superseded. He believed the rays to consist of streams of particles of ordinary molecular magnitude. It remained for Sir J. J. Thomson to expound on the subatomic nature of cathode rays (consisting of streams of negative electrons). Nevertheless, Crookes's experimental work in this field was the foundation of discoveries which eventually changed the whole of chemistry and physics. Crookes' attention had been attracted to the vacuum balance in the course of his research into thallium. He soon discovered the phenomenon which drives the movement in a Crookes radiometer, in which a set of vanes, each blackened on one side and polished on the other, rotate when exposed to radiant energy. Crookes did not, however, provide the true explanation of this apparent "attraction and repulsion resulting from radiation". After 1880, Crookes lived at 7 Kensington Park Gardens where all his later work was done, in his private laboratory. Crookes identified the first known sample of helium, in 1895. Crookes was knighted in 1897. In 1903, Crookes turned his attention to the newly discovered phenomenon of radioactivity, achieving the separation from uranium of its active transformation product, uranium-X (later established to be protactinium). Crookes observed the gradual decay of the separated transformation product, and the simultaneous reproduction of a fresh supply in the original uranium. At about the same time as this important discovery, he observed that when "p-particles", ejected from radio-active substances, impinge upon zinc sulfide, each impact is accompanied by a minute scintillation, an observation which forms the basis of one of the most useful methods in the technique of radioactivity. In 1913, Crookes created a 100% ultraviolet and 90% infrared blocking lens made from glass containing cerium, but only lightly tinted. They were an unintended by-product of Crookes's research to find a lens glass formulation that would protect glass workers from cataracts. Crookes tested more than 300 formulations, each numbered and labelled. Crookes Glass 246 was the tint recommended for glassworkers. The best-known Crookes tints are A (withdrawn due to its uranium), A1, B, and B2, which absorb all ultraviolet below 350 nm while darkening visual light. Crookes’ samples were made by Whitefriars, London, stained glass makers, and Chance Brothers, Birmingham. Crookes became interested in spiritualism in the late 1860s. In this he was possibly influenced by the death of his younger brother Philip in 1867 at age 21 from yellow fever contracted while on an expedition to lay a telegraph cable from Cuba to Florida. In 1867, influenced by Cromwell Fleetwood Varley, Crookes attended a séance to try to get in touch with his brother. Between 1871 and 1874, Crookes studied the mediums Kate Fox, Florence Cook, and Daniel Dunglas Home. After his investigation he believed that the mediums could produce genuine paranormal phenomena and communicate with spirits. Psychologists Leonard Zusne and Warren H. Jones have described Crookes as gullible as he endorsed fraudulent mediums as genuine. The anthropologist Edward Clodd noted that Crookes had poor eyesight which may have explained his belief in spiritualist phenomena and quoted William Ramsay as saying Crookes is "so shortsighted that, despite his unquestioned honesty, he cannot be trusted in what he tells you he has seen." Biographer William Hodson Brock wrote that Crookes was "evidently short-sighted, but did not wear spectacles until the 1890s. Until then he may have used a monocle or pocket magnifying glass when necessary. What limitations this imposed upon his psychic investigations we can only imagine." After studying the reports of Florence Cook, the science historian Sherrie Lynne Lyons wrote that the alleged spirit "Katie King" was Cook herself and at other times an accomplice. Regarding Crookes, Lyons wrote "Here was a man with a flawless scientific reputation, who discovered a new element, but could not detect a real live maiden who was masquerading as a ghost." Cook was repeatedly exposed as a fraudulent medium but she had been "trained in the arts of the séance" which managed to trick Crookes. Some researchers such as Trevor H. Hall suspected that Crookes had an affair with Cook. In a series of experiments in London, England at the house of Crookes in February 1875, the medium Anna Eva Fay managed to fool Crookes into believing she had genuine psychic powers. Fay later confessed to her fraud and revealed the tricks she had used. Regarding Crookes and his experiments with mediums, the magician Harry Houdini suggested that Crookes had been deceived. The physicist Victor Stenger wrote that the experiments were poorly controlled and "his desire to believe blinded him to the chicanery of his psychic subjects." In 1897, John Grier Hibben wrote that Crookes' idea of ether waves explaining telepathy was not a scientific hypothesis "he presents no facts to indicate its probability or to save it from being relegated to the sphere of bare conjecture." In 1906, William Hope tricked Crookes with a fake spirit photograph of his wife. Oliver Lodge revealed there had been obvious signs of double exposure, the picture of Lady Crookes had been copied from a wedding anniversary photograph, however, Crookes was a convinced spiritualist and claimed it was genuine evidence for spirit photography. The physiologist Gordon Stein suspected that Crookes was too ashamed to admit he had been duped by the medium Florence Cook or he conspired with her for sexual favors. He also suggested that Crookes had conspired with Anna Eva Fay. He noted that contrary to popular belief Home had been exposed as a fraud on several occasions. Stein concluded that all the feats of Home were conjuring tricks. In a review biographer William Brock wrote that Stein made his "case against Crookes and Home clearly and logically." Crookes joined the Society for Psychical Research, becoming its president in the 1890s: he also joined the Theosophical Society and The Ghost Club, of which he was president from 1907 to 1912. In 1890 he was initiated into the Hermetic Order of the Golden Dawn. Hinshelwood, Cyril Norman, "William Crookes, A Victorian man of science". 1927. Chisholm, Hugh, ed. (1911). "Crookes, Sir William" . Encyclopædia Britannica. 7 (11th ed.). Cambridge University Press. pp. 501–502. ^ William Crookes: Covert Resources and a Mentor, 1871–81. By the late Derek R. Guttery. ^ Alexander E. Outerbridge, Jr., A Fourth State of Matter. Lecture delivered before the Franklin Institute, 17 February 1881. Journal of the Franklin Institute of the State of Pennsylvania, Volume 81. By Franklin Institute (Philadelphia, Pa.). Page 287+. ^ Radio-activity induced by the oscillatory discharge, or, The subsequent radio-active emanation from substances exposed to the Tesla oscillatory discharge. Harry Marshall Diemer, Ralph Stuart Cooper. Cornell University, 1903. Page 43+. ^ Chemist & Druggist, Volume 60. Benn Brothers., 1902. Pg 268. ^ "Crookes lens definition and meaning – Collins English Dictionary". www.collinsdictionary.com. Retrieved 3 June 2018. ^ "When Were Eyeglasses Invented – Schmidt's Optical". schmidtsoandh.com. 28 September 2017. Retrieved 3 June 2018. ^ Gardiner, J. H. (3 June 2018). "Sir William Crookes' anti-glare glasses". Transactions of the Optical Society. 24 (2): 102–103. Bibcode:1923TrOS...24..102G. doi:10.1088/1475-4878/24/2/310. Retrieved 3 June 2018 – via Institute of Physics. ^ Brock, William Hodson (3 June 2018). William Crookes (1832-1919) and the Commercialization of Science. Ashgate Publishing, Ltd. ISBN 9780754663225. Retrieved 3 June 2018 – via Google Books. ^ "The College of Optometrists". museyeum.org. Retrieved 3 June 2018. ^ "Wayback Machine". archive.org. 3 June 2018. Retrieved 3 June 2018. ^ a b "Out of the shade". 9 November 2015. Retrieved 3 June 2018 – via www.thetimes.co.uk. ^ "Sir William Crookes' U "Ultimate" Anti-Glare Formula OPHTHALMIC LENSES tinted lens samples set, Sir William Crookes Anti-Glare Glass Co Ltd; Melson Wingate Ltd – British Optical Association Museum – The College of Optometrists". museyeum.org. Retrieved 3 June 2018. ^ "The Ultra-Violet Limit of Chance's 'Crookes' Glasses Compared with White Spectacle Glass and Some Common Tinted Glasses – Chance Brothers & Co. Ltd Smethwick, Birmingham, England 1920s (Promotional chart reproducing in black and white a spectral chart comparing various types of glass used for ophthalmic lenses. Landscape format, printed on one side only of a single sheet of white paper.) – British Optical Association Museum – The College of Optometrists". museyeum.org. Retrieved 3 June 2018. ^ "History – AO Eyewear, Inc". aoeyewear.com. Retrieved 3 June 2018. ^ "Colorless crookes glass". google.com. Retrieved 3 June 2018. ^ John Hannavy. (2007). Encyclopedia of Nineteenth-Century Photography. Routledge. p. 350. ISBN 978-0415972352 "Crookes' beloved younger brother had died in 1867 and the scientist hoped that spiritualism could provide a reunion. Although warned of the risk of ridicule, Crookes announced his intent to investigate mediums." ^ Sherrie Lynne Lyons. (2010). Species, Serpents, Spirits, and Skulls: Science at the Margins in the Victorian Age. State University of New York Press. p. 92. ISBN 978-1438427980 "Crookes appears to have been initially attracted to spiritualism when his youngest brother, whom he was quite close to, died of yellow fever. Brought up with the traditional Christian belief in the afterlife, Crookes was persuaded to attend a séance in 1867 to try to make contact with his brother." ^ Martyn Jolly. (2006). Faces of the Living dead: The Belief in Spirit Photography. Miegunyah Press. p. 30. ISBN 978-0712348997 "In 1867, he was devastated by the death of his much-loved youngest brother who, at the age of twenty-one. had caught yellow fever while laying a submarine telegraph cable in Cuba. At the time, Crookes was collaborating with a fellow electro-physicist Cromwell Fleetwood Varley, who was a pioneer of intercontinental telegraphy, as well as a clairvoyant. He persuaded Crookes to try to get in touch with his dead brother by spiritualist means." ^ Andrew Neher. (2011). Paranormal and Transcendental Experience: A Psychological Examination. Dover Publications. p. 214. ISBN 978-0486261676 "William Crookes, the noted English physicist, had endorsed Catherine Fox as genuine... Crookes also endorsed several other mediums who were later exposed, including Anna Eva Fay (who was exposed more than once and who eventually explained how she duped Crookes), Florence Cook (who was the subject of more than one expose), and D. D. Home." ^ Leonard Zusne; Warren H. Jones. (2014). Anomalistic Psychology: A Study of Magical Thinking. Psychology Press. p. 216. ISBN 978-0-805-80508-6 "The fact is that William Crookes, although very good at physics experiments, was rather weak on drawing inferences and on theorizing. Besides, he was gullible. He endorsed several mediums in spite of their demonstrated trickery. Having witnessed a single seance with Kate Fox, he became convinced that the Fox sisters' rappings were genuine." ^ M. Lamar Keene. (1997). The Psychic Mafia. Prometheus Books. p. 64. ISBN 978-1573921619 "The most famous of materialization mediums, Florence Cook-- though she managed to convince a scientist, Sir William Crookes, that she was genuine-- was repeatedly exposed in fraud. Florence had been trained in the arts of the séance by Frank Herne, a well-known physical medium whose materializations were grabbed on more than one occasion and found to be the medium himself." ^ Trevor H. Hall. (1963). The Spiritualists: The Story of Florence Cook and William Crookes. Helix Press. ^ John Thomas Sladek. (1974). The New Apocrypha: A Guide to Strange Sciences and Occult Beliefs. Panther. p. 194. ISBN 978-0586039748 "Crookes was forty-one, and his wife was pregnant with their tenth child. Florence was eighteen and pretty, and willing to spend considerable time at Crookes home, locked into a dark room alone with him, while beautiful apparitions were shown to him. The man Florence had secretly married, Captain Corner, put an unspiritual construction on the proceedings, and gave Crookes a beating. By 1875 the situation was becoming obvious to outsiders, who published hints that the next manifestation might be an infant phenomenon. As for the apparitions, no one but Crookes is reported to have ever seen them... By 1880 Florence had been exposed as a fraud by Sir George Sitwell." ^ Amy Lehman. (2009). Victorian Women and the Theatre of Trance: Mediums, Spiritualists. McFarland. p. 158. ISBN 978-0786434794 Crookes took 44 photographs of "Katie King," in some of which he, or Florence Cook appear alongside her. He described in detail the physical differences between the spirit and her medium. The fact that some of these photographs, which still exist, show a Katie King who looks almost identical to Florence Cook calls Crookes’ judgment, not to mention his veracity, into question. Skeptics at the time who were convinced that Florence was a fake thought that either Crookes was being completely hood-winked or that he had agreed to perpetrate the fraud with Florence. And the only explanation in either case had to be that Crookes was smitten with Florence—at the very least besotted with her and probably having an affair." ^ Harry Houdini. (2011, originally published 1924). A Magician Among the Spirits. Cambridge University Press. p. 205. ISBN 978-1108027489 "There is not the slightest doubt in my mind that this brainy man was hoodwinked, and that his confidence was betrayed by the so-called mediums that he tested. His powers of observation were blinded and his reasoning faculties so blunted by his prejudice in favor of anything psychic or occult that he could not, or would not, resist the influence." ^ Hibben, J. G. (1897). Review of Presidential Address to the Society for Psychical Research, by W. Crookes. Psychological Review 5: 362–387. ^ Brock, William. (1994). Was Crookes A Crook?. Nature 367: 422–422. ^ William Hodson Brock (2008). William Crookes (1832–1919) and the commercialization of science. Science, technology, and culture, 1700–1945. Ashgate Publishing. p. 440. ISBN 978-0-7546-6322-5. ^ Alex Owen (2007). The Place of Enchantment: British Occultism and the Culture of the Modern. Chicago: University of Chicago Press. p. 70. Ruth Brandon. (1983). Scientists and the Supernormal. New Scientist. 16 June. pp. 783–786. Ruth Brandon. (1985). Unsavoury Spirits. New Scientist 18 July. p. 52. Eric Deeson. (1974). Commonsense and Sir William Crookes. New Scientist. 26 December. pp. 922–925. William Hodson Brock (2008). William Crookes (1832-1919) and the Commercialization of Science. Science, Technology, and Culture, 1700–1945. Ashgate Publishing. ISBN 978-0-7546-6322-5. Trevor H. Hall (1963). The Spiritualists: The Story of Florence Cook and William Crookes. Helix Press. Massimo Polidoro (2000). Anna Eva Fay: The Mentalist Who Baffled Sir William Crookes. Skeptical Inquirer 24: 36–38. Wikimedia Commons has media related to William Crookes.